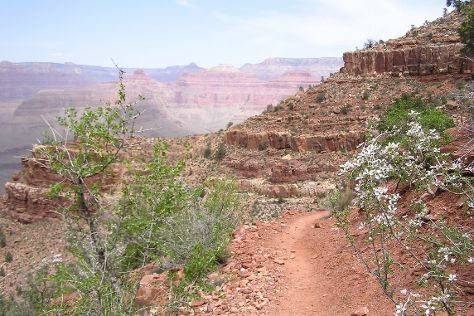 Get outdoors at Shoshone Point and Inner Canyon. Step off the beaten path and head to Pima Point and Powell Point. Step out of Grand Canyon National Park with an excursion to Mooney Falls in Supai--about 1h 05 min away. Spend the 1st (Fri) wandering through the wild on a nature and wildlife tour. The adventure continues: stroll through Hermit Trail, get great views at Lookout Studio, trek along Hermit Trail, and see the interesting displays at Kolb Studio. For where to stay, more things to do, maps, and tourist information, read our Grand Canyon National Park trip itinerary builder app . In March in Grand Canyon National Park, expect temperatures between 57°F during the day and 23°F at night. Cap off your sightseeing on the 5th (Tue) early enough to travel back home. Start off your visit on the 6th (Wed): explore the striking landscape at Rainbow Point and then take an in-depth tour of Maynard Dixon Living History Museum. Get ready for a full day of sightseeing on the next day: hike along Temple of Sinawava Trail and then take in breathtaking views at Hidden Canyon. To find reviews, where to stay, more things to do, and more tourist information, use the Zion National Park trip itinerary maker website . You can take a bus from Grand Canyon National Park to Zion National Park in 11.5 hours. In March, Zion National Park is a bit warmer than Grand Canyon National Park - with highs of 64°F and lows of 30°F. Wrap up your sightseeing by early afternoon on the 8th (Fri) to allow enough time to take a bus back home. Start off your visit on the 9th (Sat): witness a stunning natural landmark at Solitary Geyser, then admire all the interesting features of Lone Star Geyser, and then witness a stunning natural landmark at West Thumb Geyser Basin. Get ready for a full day of sightseeing on the 10th (Sun): explore the wealth of natural beauty at Old Faithful Visitor Education Center. For maps, ratings, reviews, and other tourist information, read our Yellowstone National Park online holiday builder . Getting from Zion National Park to Yellowstone National Park by combination of taxi and flight takes about 6 hours. Other options: do a combination of taxi, flight, and car; or drive. Plan for cooler temperatures traveling from Zion National Park in March, with highs in Yellowstone National Park at 36°F and lows at 10°F. Wrap up your sightseeing by early afternoon on the 11th (Mon) to allow time for travel back home. 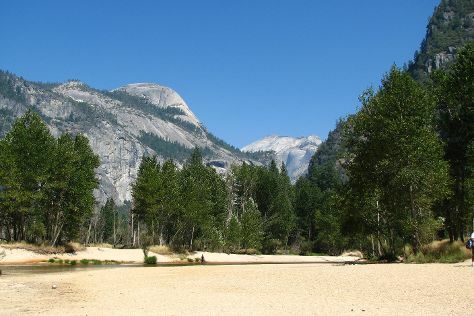 On the 12th (Tue), enjoy the sand and surf at Cathedral Beach Picnic Area, trek along Lower Yosemite Fall Trail, and then explore the world behind art at Yosemite Museum Gallery. On the next day, stroll through Yosemite Ski and Snowboard Area. For more things to do, maps, reviews, and more tourist information, read Yosemite National Park online visit planner . You can do a combination of car, flight, bus, and taxi from Yellowstone National Park to Yosemite National Park in 13 hours. Alternatively, you can do a combination of taxi, flight, and bus. The time zone difference when traveling from Yellowstone National Park to Yosemite National Park is minus 1 hour. Expect somewhat warmer temperatures when traveling from Yellowstone National Park in March; daily highs in Yosemite National Park reach 53°F and lows reach 23°F. Wrap up your sightseeing by early afternoon on the 14th (Thu) to allow time for the car ride back home. On the 15th (Fri), take your sightseeing to a higher altitude at Longs Peak, take in the spiritual surroundings of Chapel on the Rock, then explore the striking landscape of Sheep Lakes, and finally appreciate the views at Many Parks Curve Overlook. On your second day here, take in the awesome beauty at Deer Mountain and then trek along Flattop Mountain Trail. For reviews, ratings, traveler tips, and tourist information, read our Rocky Mountain National Park road trip planning tool . You can drive from Yosemite National Park to Rocky Mountain National Park in 17.5 hours. Other options are to do a combination of taxi, bus, and car; or do a combination of taxi, bus, train, and car. Traveling from Yosemite National Park to Rocky Mountain National Park, you'll lose 1 hour due to the time zone difference. In March, Rocky Mountain National Park is a bit warmer than Yosemite National Park - with highs of 61°F and lows of 29°F. Wrap up your sightseeing by early afternoon on the 17th (Sun) to allow enough time to drive back home. Start off your visit on the 18th (Mon): examine the collection at Eastern California Museum, tour the pleasant surroundings at Big Stump Basin, and then admire the sheer force of Grizzly Falls. On the 19th (Tue), you'll have a packed day of sightseeing: trek along Mount Whitney Trail and then tour the pleasant surroundings at Mt. Whitney. Planning Sequoia and Kings Canyon National Park trip won't be overwheling when you use's Insprock itinerary maker. Traveling by combination of car, flight, bus, and shuttle from Rocky Mountain National Park to Sequoia and Kings Canyon National Park takes 16.5 hours. Alternatively, you can drive; or do a combination of car and bus. Due to the time zone difference, you'll gain 1 hour traveling from Rocky Mountain National Park to Sequoia and Kings Canyon National Park. Traveling from Rocky Mountain National Park in March, expect Sequoia and Kings Canyon National Park to be somewhat warmer, temps between 70°F and 46°F. Wrap up your sightseeing by early afternoon on the 20th (Wed) to allow enough time to drive back home.